by Ron L. Docie, Sr.
You’ve just invented a new technology, a must-have product. So what now? Patent it? Manufacture it? Sell it? If you’re like most would-be Edisons, chances are your stroke of genius will collect dust waiting for you to plot your next move. 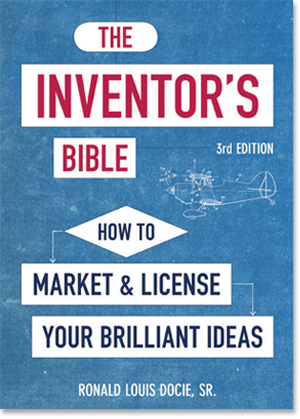 Fear not, intrepid creator – inventor and author Ronald Louis Docie Sr. shares more than 30 years of valuable insight in this revised and expanded edition of THE INVENTOR’S BIBLE, which includes a workbook to help you take your ideas from concept to profit. With everything you need to know about marketing, licensing, and selling your invention, this comprehensive handbook will also help you figure out what your invention is worth, which companies might want your ideas, and what steps to take first. You dreamt it, you created it, and it actually works – let THE INVENTOR’S BIBLE pave the way to your first million. Ronald L Docie, Sr.’s career in the world of inventions spans more than three decades. His own inventions are featured in Wal-Mart, Kmart and thousands of other outlets. As an agent for inventors, Mr. Docie has negotiated more than 50 licenses with companies like General Motors, and he’s an expert consultant to Johnson & Johnson on idea submission. He is also the president of Docie Development, LLC, an international company that provides services for inventors and corporations. –Michael S. Neustel, Patent Attorney and Director, National Inventor Fraud Center, Inc.
–Stanley I. Mason Jr., Inventor of granola bars and disposable diapers and holder of 55 patents.